I've always found that when it comes to Thanksgiving recipes, simplicity wins. Amidst all the heavy appetizers, a massive main meal, and the loads of desserts, this soup stands out as satisfyingly simple in its elements (it contains only 5 ingredients if you don't count the butter) and with all the flavors you crave on Thanksgiving day. It also gets its creaminess from the pureed squash--yep, there's no cream here--which is a welcome relief from the loads of rich and decadent foods. In fact, I've made this soup almost every year for the past decade as a Thanksgiving appetizer, and it's a win with everyone. With subtle sweetness from the apples, it's a crowd pleaser for kids and adults. I serve it in the slow cooker, set on low, so it stays piping hot. Add pomegranate seeds to garnish, and the colors are vibrant and beautifully Fall in nature. There are many ways to make a squash soup, and I always use Thanksgiving as an excuse to take shortcuts. You could buy a whole squash and cut it up yourself (more on how to do that here), or you could go for my choice and buy the more convenient (albeit: more expensive) prechopped squash.And like all soups, the longer it simmers, the better the flavors develop, so be sure to make this early Thanksgiving morning or even the day before. I've even made this a week or two before Turkey Day and kept it frozen until the day of, and no one was all the wiser. If you have a baby, this soup too is a winner! It's the perfect pureed consistency for babies who aren't quite ready for textures, but it also contains delicious flavors and spices to help expand their little palates. Use an immersion blender to puree the soup, or alternatively, transfer to the soup in batches to a blender (careful, it will be hot!). Serve warm with pomegranate seeds as a garnish. One thing is for sure at this time of year: You're going to be eating a lot of apples. Here in November, apples are the only fresh fruits left at the farm stand, and that fruit (along with pears and bananas), will be what my kids survive on until citrus season begins this winter. Happily, my kids LOVE apples--our family goes through at least a dozen a week!--but it's also nice to change things up a bit. 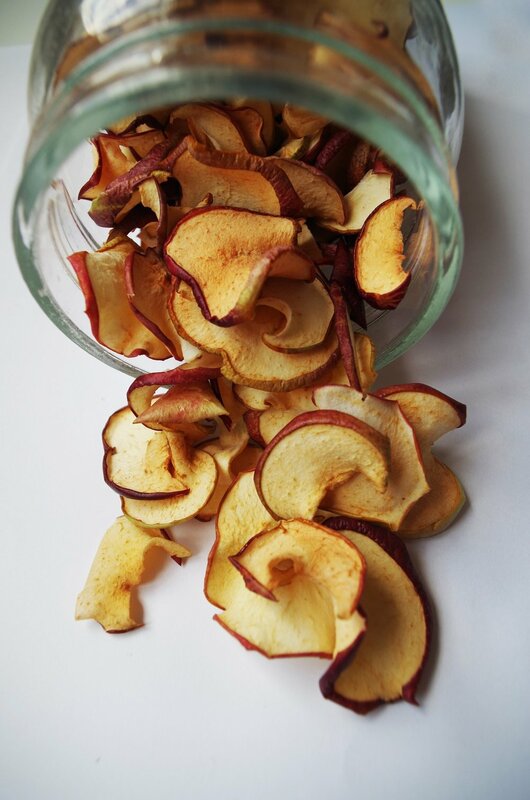 This recipe for baked apple chips is so simple, and it's the perfect project for a rainy homebound weekend day. All you have to do is slice the apples nice and thin, let the kids sprinkle on sugar and cinnamon, and then set them in the oven on low for an hour. Your home will smell wonderful all day, and you'll end up with sweet and crispy chips that are perfect for snacking by the handful or packing into lunch boxes. Arrange apples on the baking sheet in a single layer. Place the sheet on the middle shelf in oven, and bake for 45min-1 hr until apple slices are lightly browned and almost dry to touch. Let chips cool on racks completely before storing in airtight container. With all the adorable treats there are to buy and make (and eat!) on Halloween, it's refreshing to have something that you can serve that feels slightly redemptive. Especially if you're a parent like me who likes to steal their kids' Halloween candy in the name of safety. As in: "Hmm, that Butterfinger packaging looks iffy. I'm going to have to confiscate that." This pumpkin hummus has all the feels for something that looks super spooky (it's orange, after all!). And you could serve it with black tortilla chips and baby carrots, or even top it with plastic spiders! Plus, with 5 simple ingredients and 2 minutes to pull it all together, it's totally doable to make despite the chaos of the crazy day. We promise it's worth it! In a food processor, add 1 garlic clove, 1 can drained and rinsed chickpeas, 1 cup canned pumpkin, juice of 1/2 lemon, and 1/8 teaspoon of ground cumin. Puree until completely smooth. Season to taste with salt and pepper. This recipe calls for 1 pound of roasted beets, but if you're starting out with our beet baby food ( Get the recipe here) you'll want to set aside about 1 cup of pureed beets to make this recipe in place of the cooked, roasted beets below. Add the pureed beets and follow the rest of the recipe as is. 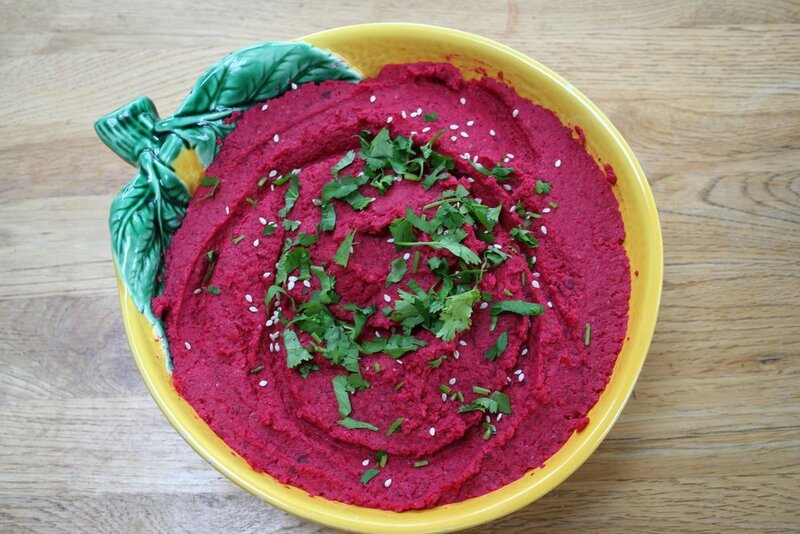 Roasted Beet Hummus Ingredients: 1 lb cooked or roasted beets, quartered OR 1 1/2 cups beet puree 1/4 cup walnuts, toasted and roughly chopped (optional) 2 tablespoons lemon juice 1/2 tablespoon tahini 1/2 teaspoon ground cumin 1 garlic clove 1 tablespoon olive oil 1/2 teaspoon salt Directions: Place all the ingredients in a food processor and blend until smooth, stopping occasionally to scrape down the sides. Taste throughout and adjust the balance as you see fit. Serve immediately or refrigerate, covered, for up to 3 days. Garnish with sesame seeds and cilantro, if desired.